I haven’t tackled that many Visual Novels since joining Operation Rainfall, but the ones I have played generally left me with a positive impression. Series like Zero Escape and the Danganronpa games really made me think, and left me wanting more thought provoking madness. Enter a new title published by Unties called The Midnight Sanctuary. It was developed by CAVYHOUSE, and all I knew about it was that it had a unique art style and creepy supernatural elements. After playing a brief demo at PAX West, I figured I might as well be the person to tackle the review. The question is, was a unique style and creepy atmosphere enough for The Midnight Sanctuary to shine? The story all takes place in a small village called Daiusu. It was built in the Edo period by Christians fleeing prosecution in Japan. It’s a very secluded and strange place, but the lure of historical context brings in our protagonist, a studious pastor named Hamomoru. She’s a very kind and quirky sort with a ravenous appetite for both history as well as any local delicacies. Seriously, she repeatedly makes a scene during the game by guzzling down platters of food, much to the astonishment of the villagers. Besides her, there are a handful of other primary characters. There’s the pushy Jyuan, son of the chief of Daiusu, who longs to help modernize the village and bring in more tourism. Then there’s the painfully quiet priest Kurosou. He seems to constantly be searching for meaning, and rarely gives away many clues as to what is bothering him. Finally, there’s the sarcastic girl in red, Eku. Treated like nobility upon arriving at the village, her goals are a bit suspect, as is the pleasant front she first shows the people of Daiusu. Other than them, there is one other important character, but in the interest of avoiding too many spoilers, I won’t talk about them. However, I will need to reveal one minor spoiler next, just to give the proper context necessary to analyze the game. So if you’re concerned about spoilers, you can skip ahead to the final paragraph, though I promise the thing I reveal next is hardly a secret to anybody that’s given even a cursory glance to the game’s Steam, Nintendo or PSN listings. It becomes quite apparent early on that there’s something off about Daiusu Village. Despite the villagers being very friendly to outsiders, they all seem to be holding secrets. Perhaps the most curious thing is how some people seem to be invisible to others. There’s a reason for that. In Daiusu, dying isn’t quite as permanent as it is everywhere else. In fact, when you die in the village, you come back as a spectral member of the Dead. You look just as you did when you perished, so those who die young are forever children, whereas those who die old stay wrinkled. Furthermore, to those without faith in a higher power, the Dead aren’t visible and can’t be heard, but to those who hold faith in their hearts, the Dead spend their days wandering about and gabbing like anybody else. Take Hamomoru and Eku, for instance. Hamomoru very much believes in a higher power, so she sees the villagers from the start of the game, which is used to great effect when she chastises Eku for ignoring a question from one of the Dead. The mystery of why the Dead are so different in Daiusu than anywhere else is sadly never answered, but it does serve as a good framing device as the story unfolds. Daiusu holds many mysteries, and at least those central to its own identity are answered by the end of the story. It’s a linear adventure, so in my 3 hours with the game, I enjoyed having small snippets of the lore of the village revealed bit by bit. The people of Daiusu are a quirky bunch, and woefully uninformed as to the norms of the outside world. It was also entertaining to watch the main characters interact, but sadly I felt most of them were just cursory sketches of people, lacking any real development. In a way, the character of the village itself is the most well developed, which is unfortunate to Hamomoru, Eku, Jyuan and Kurosou. 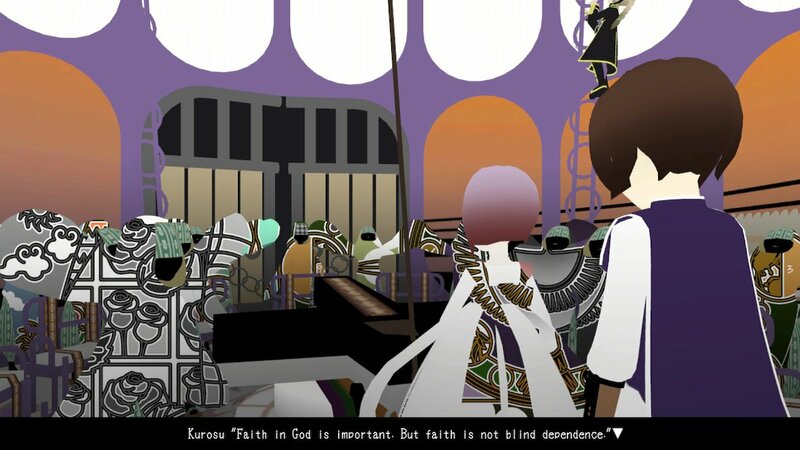 The farther you get into the game, the more you realize that Christianity in Daiusu isn’t the same either. For some reason, it’s heavily flavored by mysticism revolving around a figure called the Crane Wife. The religious aspects, meanwhile, seem to revolve around another myth about the Saint who saved the village from starvation. I won’t go into more detail about either of those, but I will say that understanding the stories are important in revealing the truth of Daiusu. They also ultimately serve as the core takeaway of The Midnight Sanctuary – be wary of religious fanaticism. Religion and mysticism are fine by themselves, but blind adherence to any tradition can lead to dangerous consequences. It wouldn’t be fair to end this review without touching upon the visual and sound design. Generally I keep this pretty brief, but there’s a lot to discuss for The Midnight Sanctuary, for both good and ill. First, let’s talk about the art. The Midnight Sanctuary uses a really unique visual style that makes heavy use of negative space. Many characters are a basic outline with jet black skin, and when they move or walk, you see stained glass travel through that empty space. It’s a really stunning visual, and one that caught my interest early on. My only complaint was that it was unclear why it was utilized more for some characters than others. At first I thought only the minor characters had this effect, but then noticed that even the main cast had some element of negative space used in their design. There’s even a flashback with some main characters where they get the full treatment, making them look just like any other villager. Which brings me to a more serious complaint. This style is great, but it makes it nearly impossible to distinguish one villager from another. The only real way to tell is when they speak, but otherwise it makes everything look a bit samey. Also on the topic of visuals, while I like the stained glass effect, the same can’t be said for the models used for the characters. Every character in The Midnight Sanctuary has very odd proportions and many walk about awkwardly, like giant unwieldy insects. Take Eku, for example. She has long, grasping arms and claw like fingers, but she’s just supposed to be a regular person, not deformed or monstrous. Likewise, the architecture of Daiusu village is often full of empty space, which makes it hard to gauge what is going on at times. In one scene it completely escaped my notice when one villager was walking in a river, for example. Finally, I dislike the visual effect for how characters eat. Hamomoru is constantly devouring food, and when she does so she holds it right up to her mouth, and the food magically disappears. I realize that perhaps CAVYHOUSE had a limited budget for effects, but this just drew attention to how primitive some animation was. Likwise, the sound design is also a mixed bag. On the one hand, there’s fantastic and distinctive Japanese voice acting for every character. I really appreciated that, and felt it helped ground the emotion of the story well. Where the game dropped the ball a bit is with odd sound effects, such as characters walking. Instead of the sound of shoes on cobbles, it sounds like angry frogs croaking. It’s quite odd, and contrasts oddly with the normal sound of walking that plays from the Map screen as you walk about. However, I had no complaints about the music, which was generally solemn and unsettling. But, regardless of the missteps in the visual and audio design, they did more good than harm, as far as I’m concerned. Now, while I can mostly forgive my other issues with the game, there is one aspect that I was very perturbed by. I often complain about anime or manga for having poorly written stories, and while the story in The Midnight Sanctuary is generally well written, it also feels incomplete. The game only lasts 4 chapters, and while there is some meat to the bone, I also felt it ended abruptly and without tying up all the loose ends. By far the best example of this is when the game suddenly puts the spotlight on a villager who doesn’t speak a word the entire game. There’s supposed to be some significance to this mysterious Watcher, but I’ll be damned if I could explain what that is. I think I’m most frustrated by this because it’s a cardinal rule of a Visual Novel that the story is conveyed through the writing. Having multiple instances where this character says absolutely nothing would be comparable to having levels in a Mario game you randomly couldn’t jump. It just goes against the grain of the genre. In the end result, while I didn’t love everything about The Midnight Sanctuary, I do feel it’s a story worth experiencing. There’s a lot of poorly designed elements, but they are outweighed by the good. For $9.99, you get a 3 hour adventure that’s perfect for playing while you’re trying to unwind. There are plenty of quirky and interesting characters, and a subtly unnerving plot here. Despite wishing the ending was less abrupt, I do feel the main story gets resolved. I just wish there was more story to draw us further into the strange village of Daiusu. If you enjoy VNs or just want to support a strange story this Halloween season, you might enjoy The Midnight Sanctuary.